Absolutely useless! Cost almost $ 500 and in less than a month it has pi ** ed away almost 25% of my money. It cuts profits short, which if you're scalping is ok, but then lets losses to run. Currently there are about 2: 1 ratio of losing trades. I purchased this robot, never had any trades on my mt4, they say its my broker , ok so i changed broker to fxopen, still no trades , did anybody else have any issues with not getting any trades, do i need to change any settings ? since it didnt work i asked them for help nothing, then i asked for a refund and all they do is send snapshots of there wins trades, thats all good but the damn bot doesn't work, keep ignoring me when i ask for a refund, any one can help me out would be glad? I use this robot for two MT4-powered trading platforms and it worked seamlessly. 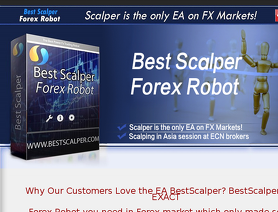 Using this robot for over a year now and I have no doubt it helped me earn big pips every time. Profit spreads move at the slightest market movement, too. Definitely recommend this EA robot and the small fee for the full license is worth the money you get back from all the trade wins. A friend suggested me. I use this robot and it worked like a charm for me. Good algorithms to scalp for best markets to trade automatically. Real-time profit margins are constantly displayed and updated. I have definitely earned back the money I paid for the license. The software calculates the trading positions carefully according to the market. So, there is nothing random with the way it lock down markets. Very pleased with all my wins while using this EA - will recommend. Installation is easy even with VPS. Very straightforward EA to use with MT4. Newbie trader when I bought this but learned quickly by using the demo account. Really happy with the results and highly recommend this robot for your trading needs. I find this robot is a lot more stable than other EAs I used in the past. I seldom experience system crash as I trade but even if I do - the robot just continues to trade while I reboot the software or even my laptop! Fully automated robot that doesn't require me to manually download anything - it does everything by itself. Very pleased with the way it works with my chosen FX broker's spreads. The expert works very well, is accurate, and works every night until Thursday. Important to avoid major economic news. Very Important broker. I changed brokers. Today my broker is Pepperstone, razor account, very good broker. The first week of June wins all. Week 2 losing record. I will judge monthly basis at least. This EA so Scalping a major difference in revenue spreads broker. The place where I'm like, this is that EA is to close the position in two hours, regardless of winning or losing. Do not buy it. I had problems with instalation and then I only lost money. I wanted to return my money in 30 days but they did not communicate with me. For me this EA is SCAM.